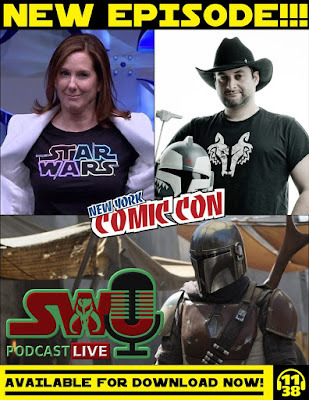 On this episode Chris and Ben dive into all the latest breaking Star Wars news, including the big reveal of Jon Favreau’s upcoming live-action series The Mandalorian. They discuss the first image, synopsis & casting rumors, and break down the diverse collection of episodic directors for the show. Furthermore, they share their thoughts on Kathleen Kennedy’s contract extension at Lucasfilm, a new Resistance preview, and more Solo tidbits. Later in the show Dominic joins in to give his opinions on all of that, plus he provides a live report from New York Comic Con! This jam packed episode is not to be missed! With the box officer trouble of Solo-I think any indication of a live action Ashoke thing pre or post Rebels is most likely gonna happen on the streaming service, espeically with rumor or more Live Action series happening in the future. In a lot of ways TV is gonna be the future of expanding the Univeres (Lol) of Star Wars in a lot of ways I feel. As for Resitance I can't wait, if it knows what it wants to be and that is a light hearted comedy action show then go for it. Rebels problem was never it's comedy so much so it's tonal shifts from comedy to drama that never felt very fluid. If Resitance has a better grasp then that's probably a good thing over all. Maybe it will get darker later on, but so long as it keeps it's Idenity then that's all the better.